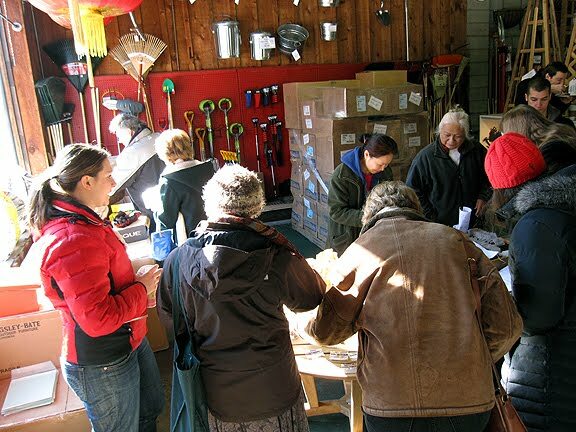 So I was very excited today to attend the Project Grow seed swap held at Downtown Home and Garden. Here's the loot from the swap. You'll have to take my word when I tell you I contributed at least twice as many seeds as I took, and that I plan to share the wealth at future swaps! 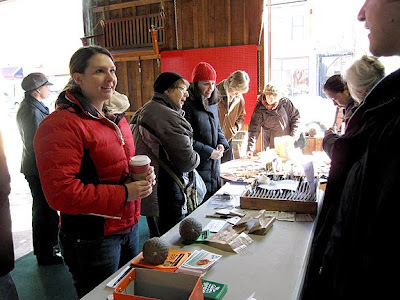 Yep, people just love talking about seeds, especially in winter. I'm really excited to try something called orach, which supposedly tastes like spinach but gets kind of viney, and a bunch of new-to-me heirloom tomatoes: 'Blondkopchen,'* 'Costoluto Genovese,' 'Coyote,' 'Garden Peach,' 'Little Lucky,' 'Pink Accordion,' 'Riesentraube,' and 'Tiger Tom.' Also scored some fennel and four o'clocks seeds. 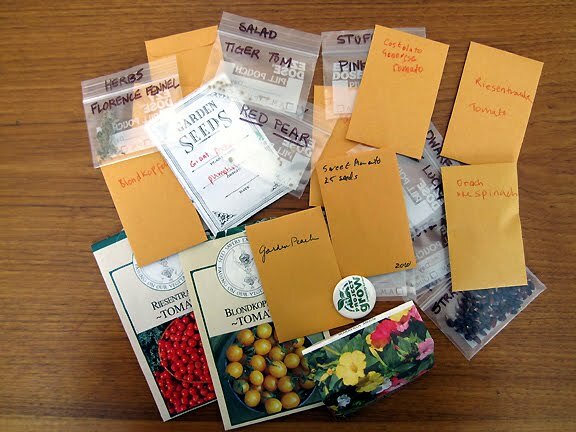 I may also have purchased some heirloom tomato seeds from Project Grow, of varieties I tasted last summer at their tomato tasting: 'Snow White' and 'Brown Berry' cherries and 'Mrs. Benson' beefsteak. I've grown over 15 varieties of heirloom tomatoes in each of the last two years and swore to myself (swore—you gotta go with your strengths, I guess) that, for a variety of reasons, I would grow no more than 8 varieties this year. Ha ha ha ha ha! The best laid plans and all that. 'Cause the list above doesn't even include my favorites 'Tiger-Like,' 'Japanese Black Trifele,' and 'Gajo de Melon' or the 'Black from Tula' and 'Dr. Wyches Yellow' (plus a purple tomatillo) from the lovely proprietor of the Populuxe Seed Bank. I guess it's high time I start winter sowing this season! Nommy! 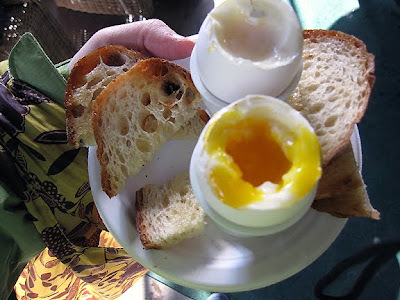 Soft-boiled eggs and toasted Zingerman's bread--all free! My dad and I loved eating our eggs this way, dipping the toast into the ooey, gooey yellow center. The fact that my mom thought this technique bordered somewhere between barbarian and childish only egged (ha ha) us on. I enjoyed the sunny, seedy swap so much, it prompted a second post in under a week. *Seed originated from the Gatersleben Seed Bank in the former East Germany, for my #seedchat friends. 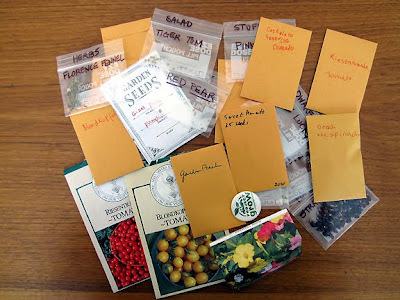 I just came back from our seed swap in Chicago and I am on a seed swap high, I tells ya! Meeting new people and all those seeds is hella fun. What fun! I love those soft boiled eggs. They make it quite the art in Europe but not so much where I live. Looks like your area has it down good though! Egged on, ha! This looks like a marvelous time! I know what you mean about tomatoes. It's just hard to limit yourself. And I just discovered eggy yolk stuff as an adult and love it. Yup, seed swaps are fun!!.. Looks like a GREAT time (and I LOVE that stove!) Are you hosting a snail mail swap again this year? Was enjoying life till I saw the eggs. Alright in cakes but disgusting boiled. Aaaaaaaaaaaaagh! I would quite like to have enough money to make it worth rolling in. I now have an image of you wearing seed-coated chocolate. Tomato seeds - I'm feeling really cross for making a mistake I've made before but forgot to learn my lesson. I've just paid £5:00 for five seeds. True, it said so on the packet. True I didn't look. I was expecting a little bonanza but had to poke around in the bottom of a little foil pack to be certain there were any in there at all! I love seeds too, and used to buy loads, especially of unusual plants one can't get in garden centres. But then I forgot to sow them, or to pot them on .... so now I have trained myself not to buy them - but I still love going through seed catalogues! That looks a really interesting place, and I love the old cooker! Monica, my dear, is there any other way to eat an egg. Here in the UK we always dip our bread into that lovely rich yolk.....gorgeous. Love the seed share thing. I have some seedlings in the greenhouse, seeds sent by your good self....so exciting. Looks like good fun ...and free food too, always a plus for me! I can see you have been having too much fun. Those eggs look yummy. I bet they were really good eating them out in the cold. Looks like fun, Monica! I'll pass on the eggs, though--I never was much of an egg eater. But the soft-boiled egg reminds me of the way my grandfather used to eat them; maybe it's a German thing. Is it too late to start some winter sowing? It's much too early to start seeds indoors here, but I've got an itch to plant something...need to go buy some seed starting soil. Mensch, jetzt erinnerst Du mich gleich daran, dass ich auch noch ein paar Samentütchen in der Ecke stehen hab und eigentlich mit säen loslegen sollte. Mjammmi, das Ei sieht lecker aus und genau so mag ich's auch am liebsten. 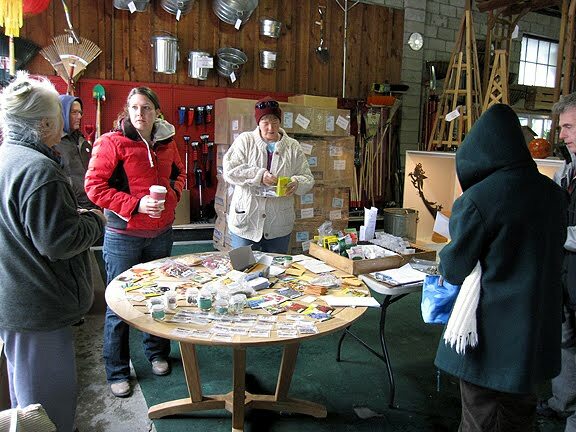 It will be so nice to go to a seed swap, I might try to organize one here. Julie says..I like soft-boiled eggs so much, I even have an egg cup collection! Great photo! What a fun event, I wish there were seed swaps here! I totally love the 1930s stove. Awesome. It's been forever since I had a soft-boiled egg, but I sure did love them when I was a kid. Mom had pretty egg cups, and I always thought it was the coolest breakfast ever invented. 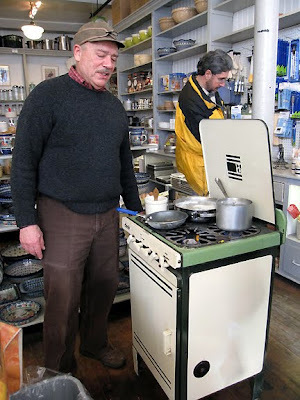 I have a real weakness for vintage stoves - that one's a real gem!